Don’t ask the Old 97’s to tell you what “alt-country” means. They have a general idea – they’ve been playing it for the better half of two decades, after all – but no one is comfortable offering up an official description. Bassist Murry Hammond is the group’s elder statesman, with salt ‘n’ pepper hair and oversized, geek-chic glasses that make him resemble a cross between an English professor and Reckoning-era Mike Mills. He’s the bandmate with the strongest Texas accent, the most rustic-sounding songs, and – in keeping with the country theme – a son named Tex. If anyone can explain the alt-country movement, and how the Old 97’s came to be spokespersons for a genre they didn’t mean to create, it’s him. When grunge began to loose its foothold in the mid-‘90s, record labels rushed to find something else – some other marketable genre, with a “look” as well as a sound – to fill the void. They picked alt-country, a style of music unconsciously pioneered by groups like The Jayhawks, The Old 97’s and Uncle Tupelo, all of whom combined the basic tenets of country music – rustic harmonies, acoustic guitars, melodic twang – with the boozy irreverence of rock and roll and punk. The Old 97’s leaned heavily on pop music, too, which made them perfect candidates for a big mainstream push. After spending three years in the company of small indie labels – including Bloodshot Records, who issued the band’s sophomore album in 1995 and launched the solo careers of Neko Case and Ryan Adams several years later – The Old 97’s signed with Elektra Records in September 1996. It was a big move, not only for the band itself, but the entire alt-country movement as well. Uncle Tupelo’s two spin-offs, Son Volt and Wilco, had already landed major-label deals with Warner Bros, and The Jayhawks had signed with Rick Rubin’s Def American. 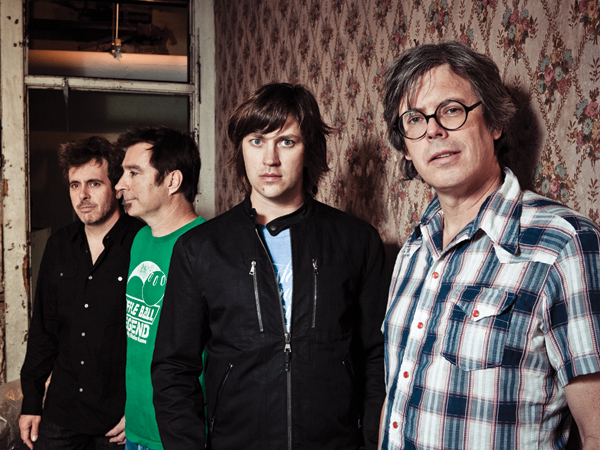 With The Old 97’s stepping up their game, alt-country officially entered the big leagues. By industry standards, though, it was a bust. The Old 97’s released three records under Elektra’s wing – Too Far To Care, Fight Songs, and Satellite Rides, arguably their finest trio of albums – but only Satellite Rides, which strutted onto the Billboard charts at number 121, enjoyed any degree of mainstream success. Three months after the album’s 2001 release, Wilco ran into its own share of major-label trouble when Reprise rejected Yankee Hotel Foxtrot, claiming that the record – which has since sold more than 650,000 copies, making it one of the genre’s only gold-certified albums – wasn’t commercial enough. Clearly, the major labels weren’t getting it. Speaking from his Hudson Valley home one day before the Milwaukee gig, Miller talks a mile a minute, referencing Jean-Paul Sartre one moment and The Office’s Rainn Wilson the next. Like his sweaty, hyperactive stage persona, the guy is a whirlwind on the phone, giving articulate answers to each question while surreptitiously snacking on something crunchy (crackers or pretzels, most likely), singing the occasional line from whichever Grand Theater song we’re talking about, and horsing around with his two children, Max and Soleil, who aren’t quite ready to relinquish their Dad to the road. Silence. Max and Soleil are either too shy to answer, knowing there’s a stranger on the phone, or they’ve run off to another room.